In 1988, the Orleans Conservation Trust acquired the Woods Cove Conservation Area. 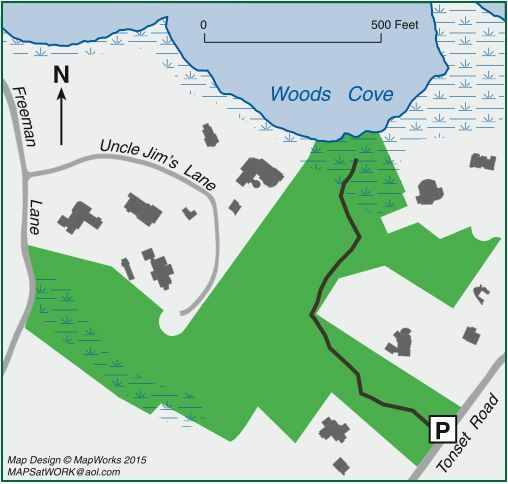 The Woods Cove parcel consists of 11.6 acres of upland forest, wetland, and salt-marsh ecosystems. The property is extremely important for wildlife habitat, wildlife corridors, coastal resources, and scenic value. Due to the variety of habitats within this area, plants and animals can migrate through this area. The most important feature of Woods Cove, however, is the presence of vernal pools, which are ideal breeding grounds for many amphibian species, such as the wood frog and red-backed salamander, which have both been observed on site. Trailhead Parking: From the intersection of Rt. 28 and Main Street in Orleans, drive east on Main Street (.4 mi) towards Nauset Beach. Turn left on Tonset Rd. at the lights and follow for 2.2 miles to trail head on left. Look for an OCT sign and an opening within a stone wall. There will be two-three parking spots.